This is a very traditional way to prepare the green mango chutney in our home. 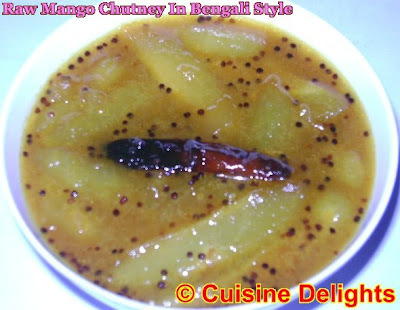 This green mango chutney is always made with fresh unripe mangoes. In traditional Bengali meal usually consists of five to six courses, starting off with something bitter and ending with a sweet dessert. The fifth course served just prior to the dessert is the sweet & sour chutney. Wash and roughly peel the raw mangoes. Chop them. Heat oil in a kadai, add red chilly and musturd seeds, when seeds are splutter then add chopped mangoes, turmeric powder and a pinch of salt. Saute the mangoes. The mangoes will take on a yellow colour then add water should be enough to cook the mangoes. 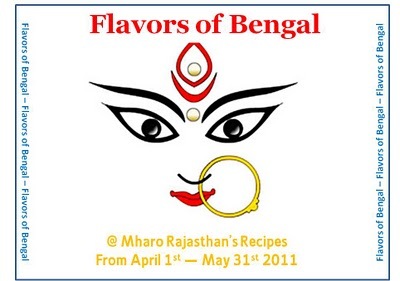 The chaatni should be thick , mix and cover to cook till mangoes are done. When water is starting to boil then add sugar or jaggery according to your desire quantity of sweetness. 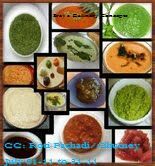 Also Sending this to Srav's Culinary Concepts "CC-Roti Pachadi/Chutney"